Perfect location to town. Very cute cottage with hardwood flooring. 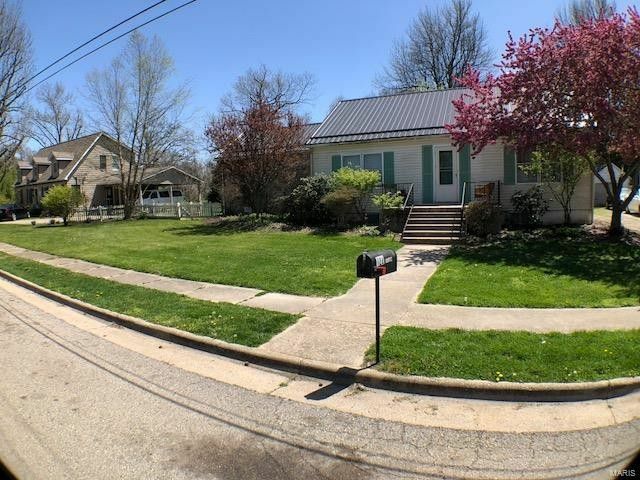 Built in 1939 with an addition of a master bedroom and bath. 3 total bedrooms and 2 baths. One bedroom used to be the utility room and could be converted to that again. Separate dining room, living room with a wood burning fireplace and family room off the dining and kitchen currently being used as a bedroom by the tenant. Loads of light everywhere. Detached 1 car garage has an attached screened in porch. Very cool!! with window boxes. The property has a shared driveway with a very nice neighbor. Metal roof and vinyl siding and rock front. Full basement with stairs walkout. This is a really cute home. Directions: St James 68 South, left on Dillon, home on right.